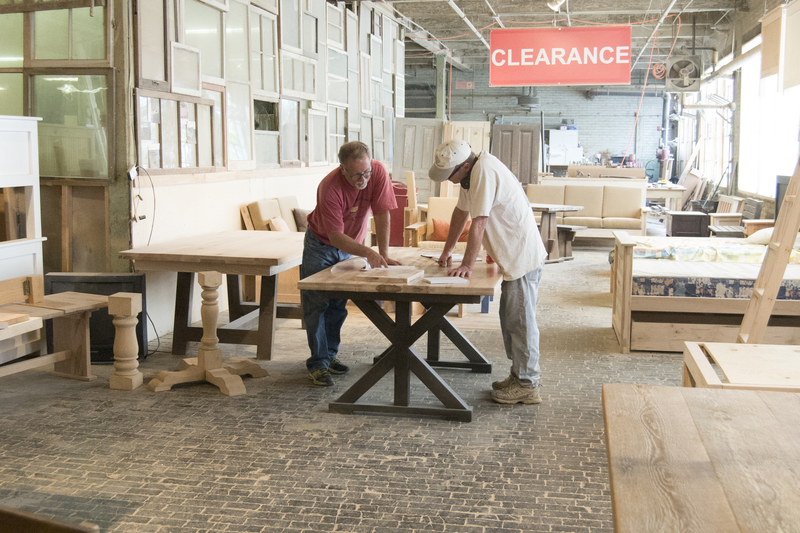 Coleman Moore and Mark Petersen look at wood samples in the showroom of The Custom Cottage furniture shop in Grand Rapids, Michigan. 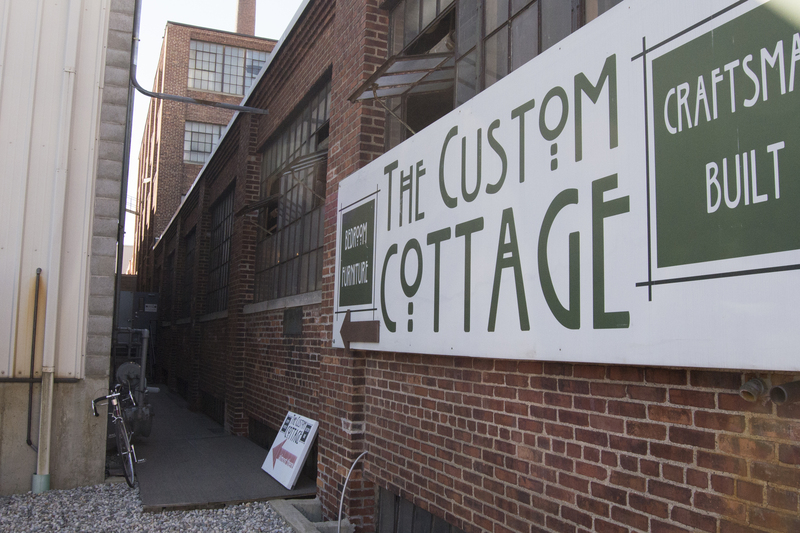 The Custom Cottage is a furniture shop in Grand Rapids, Michigan, located in the back of a red brick factory that covers a city block. 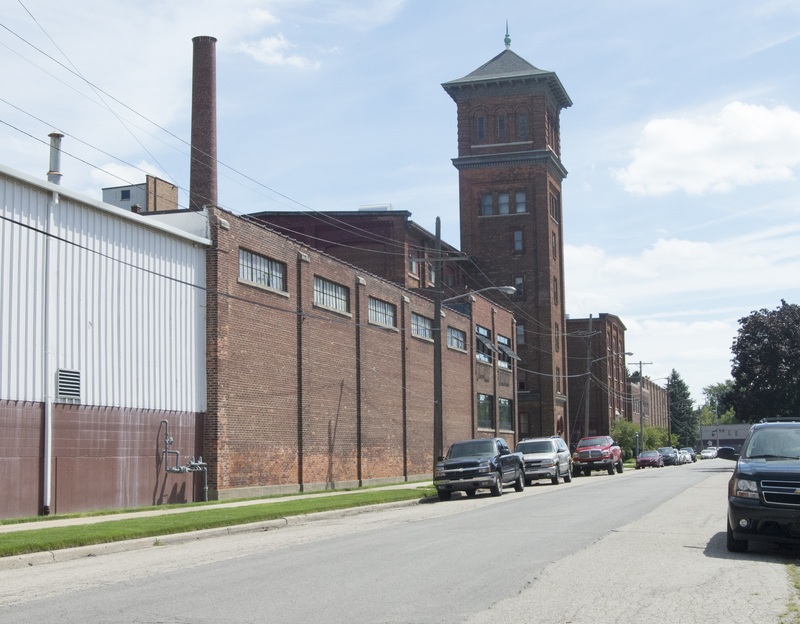 The factory’s tall, Italianate tower hovers over the surrounding neighborhood like a church steeple. Inside, a thick yellow-green dust has settled everywhere—on the saws, stacks of boards and worktables, on bunk beds, queen beds, bookshelves and dining tables, on a black leather Bible that rests on a small table near the entry, even on the shop’s founder, Coleman Moore. He is a shorter man of 60, in jeans, a faded work shirt and a pair of aquamarine glasses that bring out the bright blue-green color of his eyes. With two pencils poking out from his pocket, he looks the part of a lifelong furniture builder. But he was many other things—a real estate developer, a student at nearby Calvin Seminary, a pastor and a church planter—before he built his first piece of furniture. Even then, he had no idea that a one-off project for his wife would become a business, or that he would employ ex-cons, alcoholics, drug addicts, homeless men and returned soldiers, training them to become craftsmen. Like Coleman, this place took me by surprise. 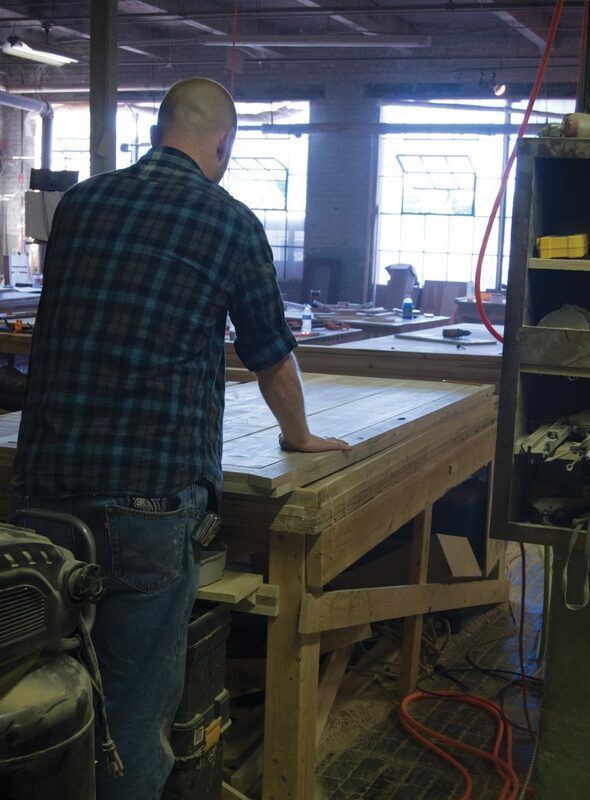 When I first came into his shop my mission was simple enough: to plan the construction of a dining room table for my growing family in South Bend. I had no idea that God might want to open a similar furniture shop in Evansville, a place where our neighbors might one day come to find that most precious of modern human necessities—a job. Coleman Moore grew up in the mountains of east Tennessee. His father was an executive who traveled often, so busy with work that, as Coleman recalled, he only came to one of his son’s baseball games. “If I was going to spend any time with him, the only opportunity was to do what he was doing,” Coleman said. That meant working alongside him in the basement wood shop, where father and son built shelves for the house and a pergola for the backyard. The son took to the work, making his own Soap Box Derby car and a pontoon boat from Styrofoam and cedar. None of this seemed relevant to Coleman’s career path. After college, he became an executive with a real estate development company. He managed a development in downtown Dallas with three office buildings and a 12-story hotel with an ice skating rink in the atrium. By the world’s standards, he and his wife Mary were doing fine, with three children, a house and a cottage on the Gulf of Mexico. They were churchgoers, but largely for their children’s sake. Then one Lent, Coleman decided to read the Bible straight through. It took him 18 months, but when he got to the end, he told Mary that the Bible had “an absolutely radical message.” He said that they should either start living by it or quit pretending to be Christians. They chose the former, and eventually God called them to move to Grand Rapids, where Coleman enrolled in Calvin Seminary and began studying to be a pastor. To pay the bills, Mary began working full-time on a night shift as a labor and delivery nurse, giving up the time with her children that she had treasured in her former part-time job. “That was a very, very difficult switch for me,” she said. Times were tough for the Moores. “The family went to negative cash flow,” Coleman said. After graduation, they moved to North Carolina, where Coleman started an interracial church called The River. It was there that he also learned about the charismatic movement. At a charismatic conference, Coleman heard an invitation to come up for prayer to be baptized in the Holy Spirit. He waited until the last moment, then went forward, falling to the floor after hands were laid on his head. For 20 minutes, he had “an amazing conversation with God.” When he got up he had decided he would not speak for one week. In that silence, he began to learn to recognize God’s voice, how to distinguish it from the clutter and noise on one hand and the snarling whispers of the enemy on the other. “I wasn’t the same,” he said of the experience. He figured that a new call would come from a church, and began searching for Reformed congregations of a more charismatic bent, but no calls came. Then one day in 2012, Mary asked Coleman if he would build a headboard for their bed, since she couldn’t find the kind she wanted anywhere. “I’d been looking on Craigslist because we didn’t have a lot of money, trying to find a headboard in the shabby-chic style,” she said. 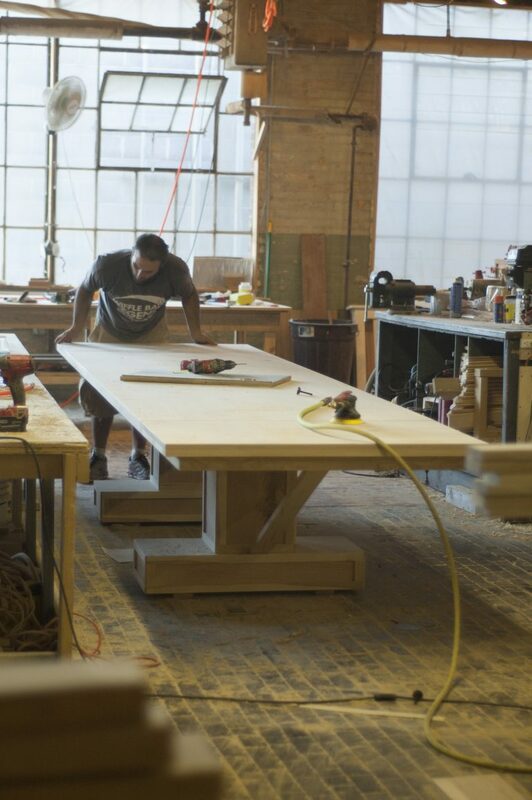 Dan Romero is building a 10-foot-long dining room table. Each piece at The Custom Cottage is built to specifications set by the customer. Coleman finished the headboard and posted a picture on Craigslist, figuring that if Mary wanted one, perhaps others would too. A few orders came in and he began filling them in his garage. The fledgling company soon graduated to a four-car garage, then to a 3,000-square-foot space in Rockford, a Grand Rapids suburb. The orders kept rolling in: for beds, for nightstands, desks and entertainment centers– so many orders that he hired seven people. The business was growing, but Coleman saw it as little more than a stopover. “I’m still thinking, Okay, Lord, when is that church going to open up that you want me to pastor?” That perspective changed on a Sunday in April, 2013. Ryan Walkes, a guest speaker at his church, described the Bridge Street House of Prayer, the inner-city ministry he had founded in Grand Rapids. Walkes made a passing comment about how the people they were meeting needed jobs. For Coleman, it was a revelation. He saw the purpose of his life laid out before him—to provide jobs for people in the inner city. “The Spirit moved, and moved my heart,” he said. Walking out of church that day, Coleman was asking the Lord what he should do next, when God spoke to him in no uncertain terms: Do nothing for two weeks. For a man of action, it was a hard message. “I’m not good at waiting,” Coleman said. But he waited anyway. Two weeks later, early on a Sunday morning, he woke up suddenly. God began to speak to him again: Get up now. I am going to give you a vision. Write this down. Then, on a Sunday morning in June, 2013, he woke up and heard God speak to him once more. He had the sense that he should drive to a building he had seen on the Internet, an old factory. There, he saw a sign advertising space for lease. He called the number and arranged a tour. “It had no door, only a fire escape entrance. No docks,” Coleman recalled, but the price was “unbelievably low.” He signed a lease and The Custom Cottage opened in the old factory in August, 2013. His first two employees at the new location came from the Bridge Street House of Prayer ministry. I first heard about The Custom Cottage in the fall of 2013. Their Craigslist ads showed pictures of dining room tables made from old barnwood, their long planks revealing the curved swirl marks of ancient, steam-driven circular saws. A few weeks later I had to go to Grand Rapids for a conference and managed to stop by the shop. I met Coleman, then realized it would be worth returning with my wife Gretchen. When we came back in January, we both were excited about building a table, but reality set in as we realized we would need to save up the money. It took two years of stashing money from Christmas checks and selling less important possessions, but by Christmas, 2015, we had met our goal. On a snowy Martin Luther King Day, we brought our whole family to the shop to place our order. We were met by Ross Graveling, Coleman’s right-hand man. Ross helped us finalize our plans for a table that would be seven feet long by 44 inches wide, with two leaves that would take it out to nine feet. It would be made from long maple planks with knots and striations of dark color. 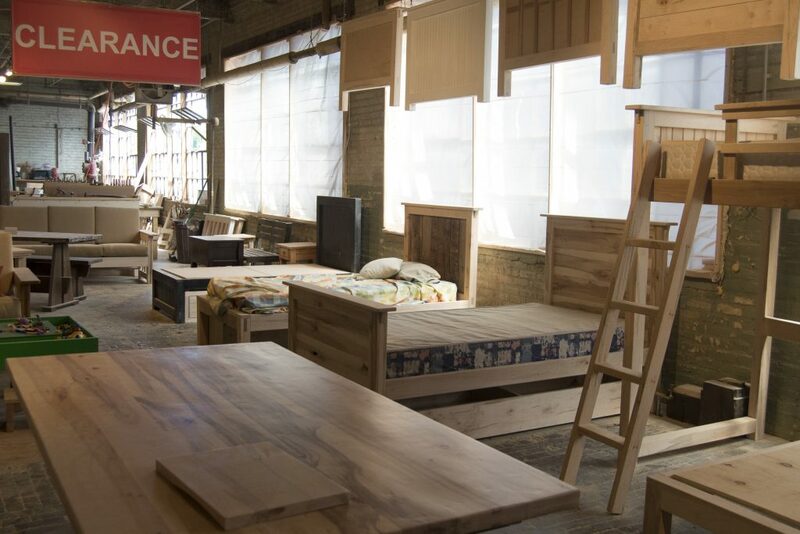 The Custom Cottage showroom, in the front of the shop, includes beds and tables in a variety of styles. Seven weeks later I returned with Jeremy Osterhouse to carry our table home. As we dusted it off and removed the top for transport, Coleman told us more about his approach to the business. 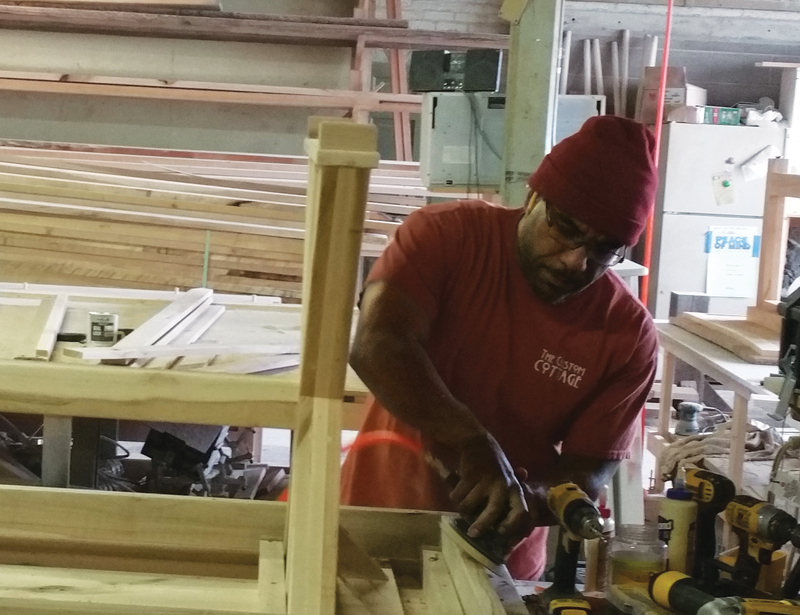 The mission of “Building lives through building furniture” shapes many of the practical details of how the business operates, leading Coleman to some interesting innovations. One is complete flexibility of scheduling. Each builder has a set of keys and can work any time he wants, 24-7. 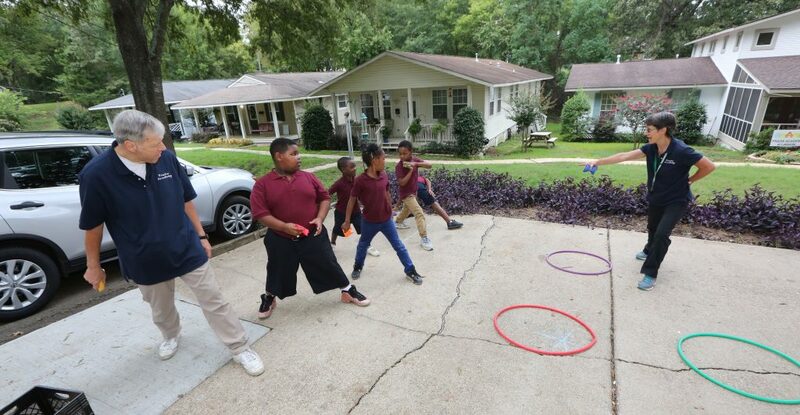 “If they need to be home to take care of the kids, if they need to go along on a field trip or be there for a sporting event or a play, that’s fine. I encourage that,” Coleman said. This means that Coleman never has to hassle or punish a worker who’s late if a car breaks down or if he needs to leave to see his parole officer. Another innovation has to do with pay structure. He pays each of the builders minimum wage—$8.50 an hour in Michigan—and then pays them by the piece on top of that. He said a trained builder should be able to make between $15 and $20 per hour. Some of the workers do earn that much, and those who don’t are offered further training. Elijah Mosley works on a table. 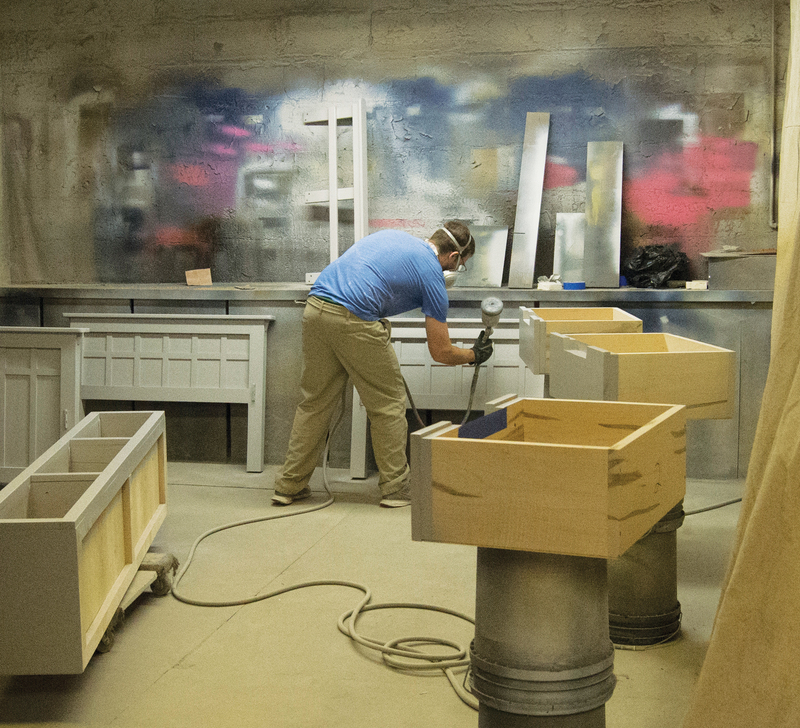 Chris Conley works in the paint room, where he paints, polyurethanes and stains furniture. He also set up the business so that he rarely will have cause to fire someone. Coleman said there are only two reasons he would consider letting someone go. First, if a builder, after getting trained, demonstrates no aptitude for furniture making. Second, if he simply never shows up, holding a place that could go to someone else. This means that no one will be fired for drinking on the job, cussing out the boss, messing up orders or getting tossed in jail for a couple of nights. “I can handle getting cussed out,” Coleman said. Impressed, I told others in the community about Coleman and the shop, including Nick Holovaty, who is responsible for the Mission program office, and my boss Paul DeCelles, who has overall responsibility for our mission work. We had been talking about how we could employ our neighbors in our mission locations, and we wondered whether Coleman’s model might work. Paul suggested I return to the shop and write this story. I returned in March, hoping to meet some of the builders and learn about their experience. I arrived in time for lunch, which the builders eat together each day. They share stories from their lives in an atmosphere of brotherhood that reminded me of a men’s group. A time of prayer follows lunch, with one of the workers reading a Bible passage and a short reflection. Each day at the shop, the workers gather for lunch and a time of prayer, swapping stories and praying for one another’s needs. Elijah Mosley is a 37-year-old African American, a husband and father of seven children. He’s the most experienced builder and the natural leader on the shop floor. 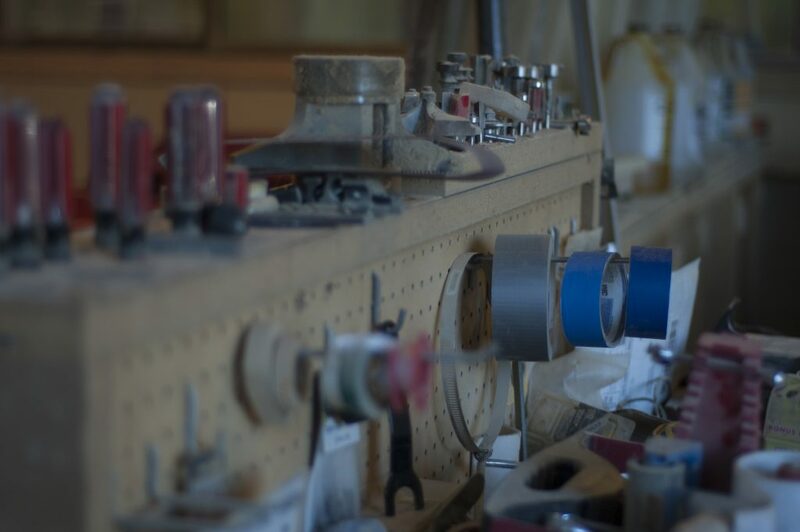 He said he’s built every kind of piece the shop produces, and he has a fierce pride in his work, borne out in the pictures he takes and posts to Facebook. “To build something you have to see it in your head,” he told me. “It’s like a big puzzle. That’s the whole joy of what I do. You are able to take something and make it your own. It’s a craft.” He told me the story of a woman who saved her money for 15 months to buy a bedroom set, then came in and paid for the whole thing in cash, rather than putting down a deposit like everybody else. Eli saw the joy she had when she finally received her furniture and would not forget it. Eli also had a warning for me. He wanted me to know that not all the employees had troubled pasts, and even those who did should not be seen in light of those pasts. They are builders now, and the mission of the shop belongs not just to Coleman but to them. “I feel it’s us, the workers, that keep the company driving, keep Coleman on his toes,” he said. 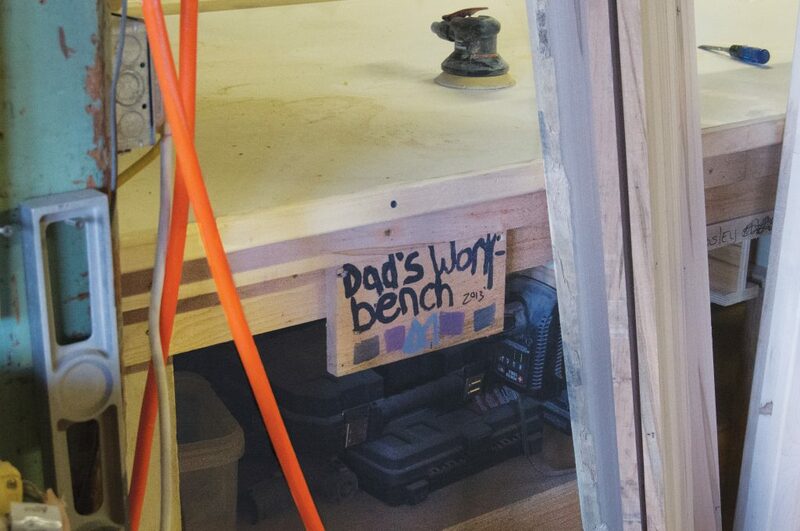 Eli Mosley’s workstation features a sign made by one of his seven children. Another builder, Mark Petersen, 59, is clean-shaven in jeans and a gray t-shirt. Like Eli, he also posts pictures of his work to Facebook, and he talked proudly of a barnwood table with a trestle base painted light green that is featured in The Custom Cottage ads. When I met him, Mark had been working at the shop for a little more than a year. He said that two years earlier, he’d spent time in jail on a drunk driving charge. He’d been out of jail for only a month when he learned that he had stage three cancer in his neck. After chemotherapy and radiation treatments, it took him more than a year to recover, then he went to work at The Custom Cottage. “I live by myself,” he said. “I don’t have a family and because of my past my finan - cial situation isn’t the greatest, so it’s nice to be able to make extra money when I need to. It also keeps me out of trouble. You live by yourself, you get bored at home, you get tired, and a lot of times it’s like, man I need to get out of here, I need to go do something, and you end up doing something you might regret, go to the bar, but instead you just go to your job, make some money and keep yourself out of trouble. It’s been a very good plan for me. Two weeks later, I was back in the shop. I had asked Coleman if he would take me through the same training he gives the other builders. I brought along Rus Lyons, one of our missionaries, who wanted to see if something like this shop might work in Evansville. Coleman said we would begin like all the builders do, by making a bed. He got us started by sketching a plan for the bed, a job the builder himself would normally do. (Planning is one of the hardest skills to master, and Coleman wants each builder to learn how to do it.) Next, he explained the shop’s system of building, which involves putting wood together in layers. By the end of the first day, with Coleman standing close by to answer questions, I had finished putting together the headboard, while Rus had begun working on a set of storage cubbies that would slide under the bed. The next day I built the end rail and began the long, slow process of sanding everything. Rus Lyons at his work table, where he was building a king-sized bed. When the bed was finally ready to assemble, Mark came by and gave it a shake. It had quite a wobble, and my heart wobbled along with it. I figured a legion of rookie mistakes had added up, creating a permanent instability. But the story wasn’t over. It turned out we hadn’t secured the brackets properly. Once they were locked down, we shook the bed again and it hardly moved. Mark gave me a fist bump. 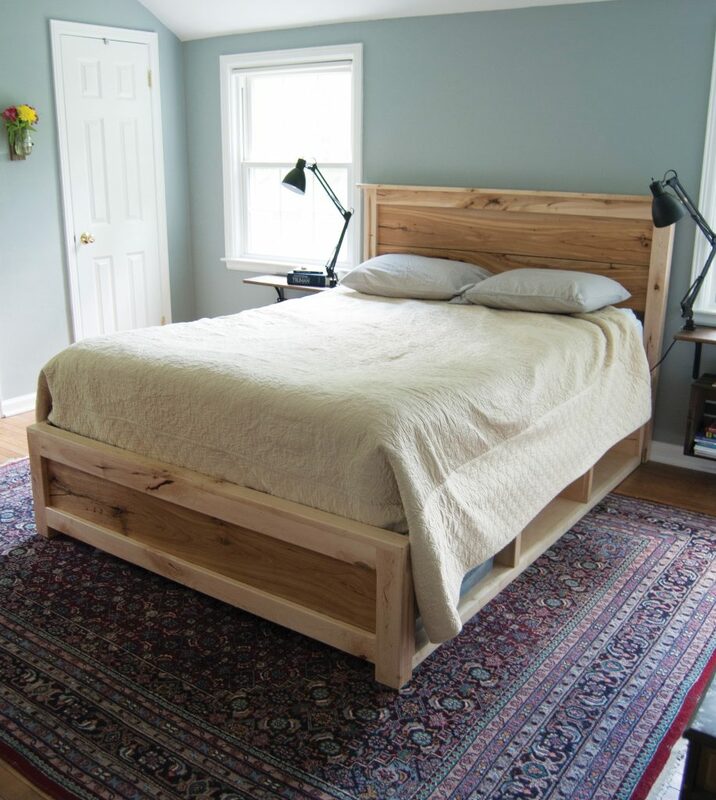 Sean Connolly and Rus Lyons built this bed together out of maple and barnwood while Sean was working on this story and Rus was discerning whether to pursue an apprenticeship at the shop. The thrill of building is hard to describe. It felt like a runner’s high and stayed with me for some time. I could only imagine how good it would feel to someone who had spent years in prison or living on the streets–a thrill that no drug or crime could induce and that no Boss or Government Agent could ever take away. Before Rus and I headed home after our training, Coleman said, “I tell you what, you guys sure qualified to be builders.” We would have made the cut, and that only added to the thrill. We were pumped! For Rus, passing this training meant more. 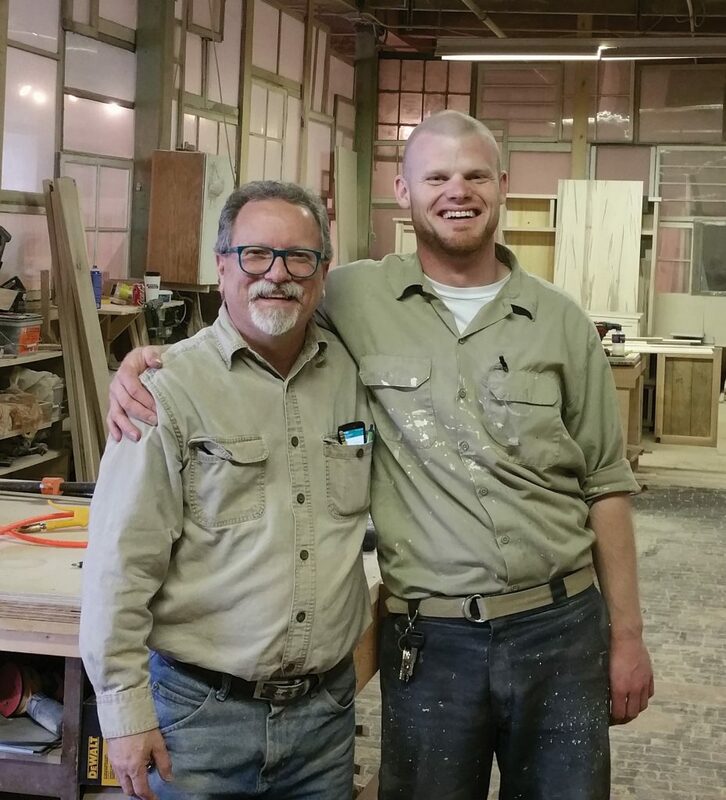 After praying and talking with Nick, Paul and the other missionaries, he accepted an offer from Coleman to apprentice at the shop. In May he moved to Grand Rapids for six months to a year. Coleman will teach Rus every aspect of the business: building the pieces, painting and staining them, fixing mistakes, marketing and advertising, sales, accounting, etc. Rus’s intention is to open a furniture shop in Evansville on The Custom Cottage model, and Coleman has agreed to help him get it started. 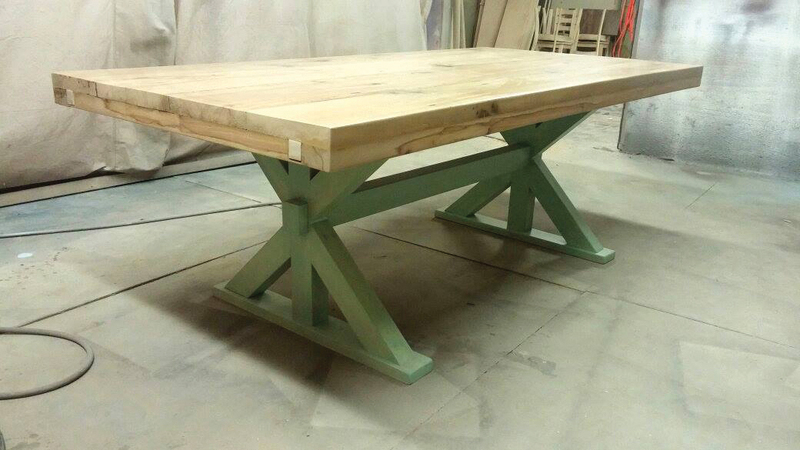 Two photos of a trestle table built by Mark Petersen, a design that has been popular with customers. Coleman told me that talking with Rus has expanded his vision. 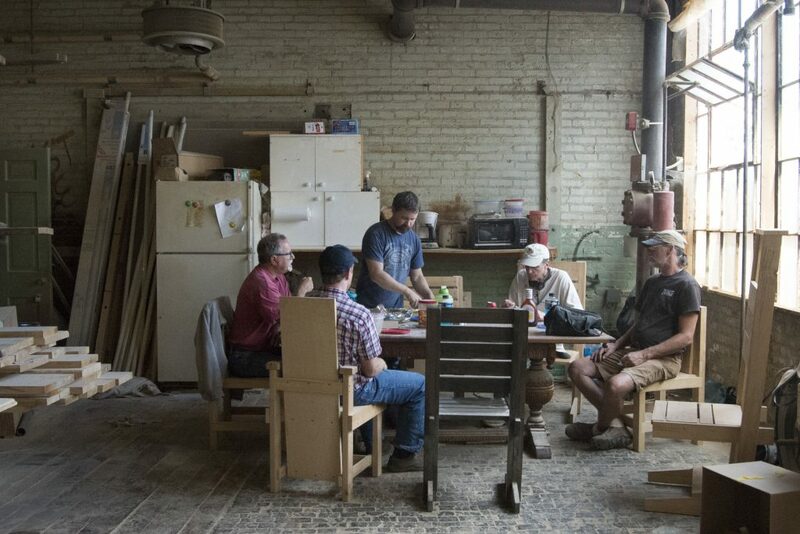 He very much likes the idea that a furniture shop in Evansville would not only be transforming individual lives, but be part of “something bigger that God is doing”—the transformation of an entire neighborhood and community. “Imagine yourself as a living house. God comes in to rebuild that house. At first, perhaps, you understand what He is doing. He is getting the drains right and stopping the leaks in the roof and so on: you knew that those jobs needed doing and so you are not surprised. But presently He starts knocking the house about in a way that hurts abominably and does not seem to make sense. The parable is a fitting metaphor for Coleman’s life–a real estate developer turned pastor who fully expected to build a church of a certain predictable type. But it turned out God wanted to build something else, a dusty palace, a place where each day he would go to work alongside his friends, Coleman, Eli, Mark and the others, building lives and building furniture. This is so hopeful!! May God bless all that you do!! What a powerful story, and what a potentially great step for us to take in building the Kingdom . It doesn't get more practical than this. Lord, help us to open doors to employment for your sons and daughters again and again! We purchased two twin beds for our boys in 2014 and will be buying more furniture very soon. The mission of this company is heartwarming and the quality of the furniture is superb. So very happy to read this and so proud to know you and Mary. May God continue to bless your wooed and your family. About a year ago I saw an ad on Craig's list for Custom Cottage. I could tell there was a Christian foundation from the 1st time I visited, but had no idea the extent and how deeply the lives of the individuals who work there have been affected given the opportunities that Coleman has provided. They made an awesome barn door and shelves and are currently making my dining table. I can honestly say I will appreciate and treasure my pieces even more now that I know the story and lives behind them. God Bless!! What an amazing story!! I will be looking you up next year as we build our new home in Traverse City. 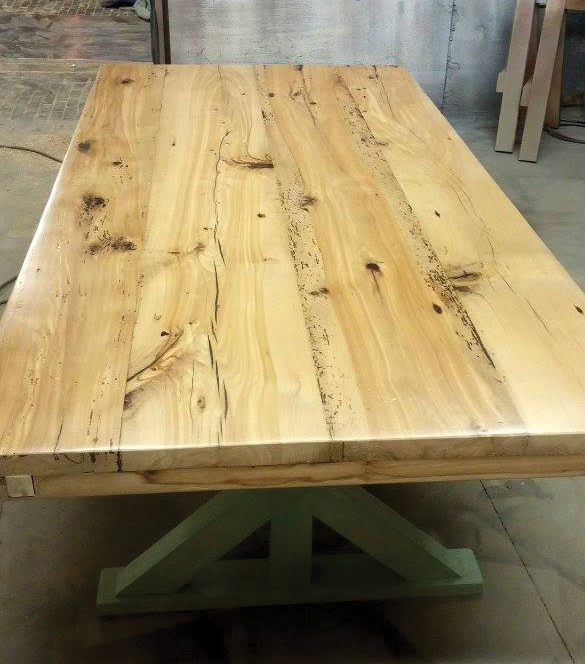 We need a custom dining room table and you are exactly the gentlemen to do it!